Mine also is pretty much the same recipe, whole wheat bread because that's what I have in the house, almond milk for the same reason, canadian bacon because the sweetie man doesn't know what pancetta is—there's a Northern Exposure darmok that covers the sweetie man buying all my groceries for me, which it occurs to me actually is about pancetta—and ground turkey also because that's easier to find. Heat oven to 400 degrees. Dice the bread and soak it in the almond milk in a small bowl. Finely chop the canadian bacon, onion, and garlic and saute for about ten minutes until softened. Also stem and finely chop the parsley. Drain the excess milk out of the bread. You can beat the egg in the same small bowl, a few drops of almond milk isn't going to hurt. Then combine the onion mixture, bread, egg, turkey, and one tablespoon of the tomato paste in a large bowl. 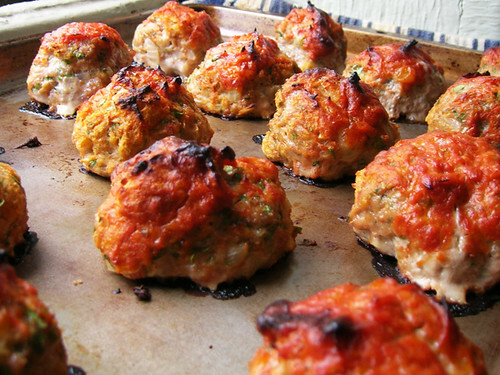 Here it's easiest to divide the meat mixture into fourths and each fourth into fourths to form sixteen meatballs. But I kind of want three meatballs per serving, four is too many, which means divide the mixture into thirds and each third into fifths. I know, why can't I make an easy sixteen meatballs and just have the sweetie man eat one out of the oven. Becauuuuuse then the meatballs are smaller. Leave me alone, put the meatballs on a baking sheet. Stir together the other tablespoon of tomato paste and the olive oil, hello, in the same small bowl that you had the almond milk and egg in, and brush the paste over the meatballs. In addition to a great rubber spatula, I also have a silicone brush that works great for this. I don't know why I have this brush. Oh, because I wanted to brush butter on my airpopped popcorn.